WoW: Cataclysm on December 7th? Both Wowhead and MMO Champion discovered some interesting text in the game files for the next Cataclysm beta patch, where it could be read that season 9 of the Arena player-versus-player competition begins on December 14th. 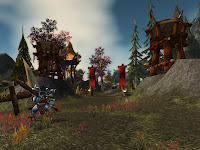 A forum post from Blizzard stated that season 9 begins “approximately one week after the official launch of World of Warcraft: Cataclysm”. This means that World of Warcraft: Cataclysm would release on December 7th. We’ll wait for an official word on this.